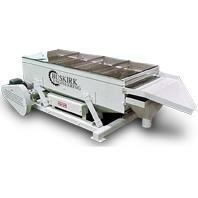 The Vibratory screener removes fines through a sifting action and cools with air. The unit is 18" Wide by 10' long and utilizes a 1 hp motor with a reciprocating screen action. The unit has an optional air discharge manifold for cooling, 700 cfm of air is required. Capacities up to 2 tons per hour, with lengths up to 25 ft. are also available.